American Metalcraft BB816 Rubber Wood Cutting / Charcuterie Board with Handle - 16" x 8" x 3/4"
Seasoning your wooden cutting board is an essential step to keep it looking and functioning at its best for as long as you need it. Using a product like Emmet’s Elixir Wood Conditioner helps preserve the life of your board so that you can continue to produce mouthwatering meals. Before you start, wash, rinse, and dry your cutting board carefully. Apply the elixir according to the manufacturer’s directions. Rub it in firmly on all sides and the front and back of the board. Let it sit for about an hour. Buff your cutting board gently and it will be ready to use! Taking proper care of your wood cutting boards is an essential step that will help extend the life of your board. This instructional video will show you how to properly season a wood cutting board to ensure it remains in great condition! 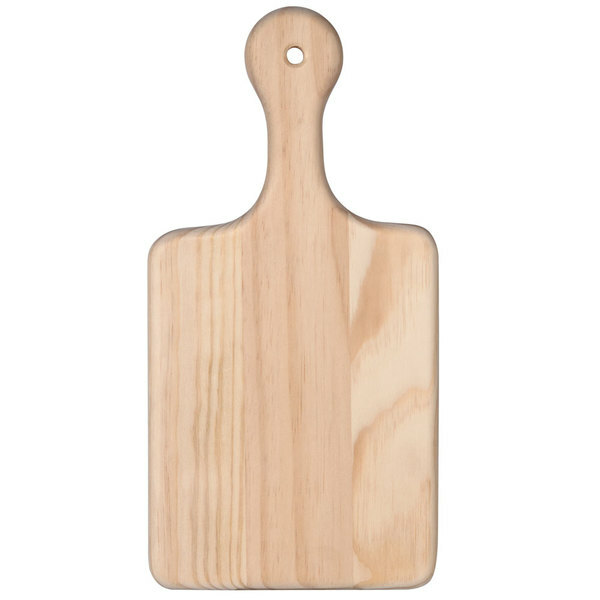 What is the best way to clean and care for my wooden cutting board? All wood products should be hand washed. The heat and chemicals of a dishwasher are harmful to wood’s naturally porous texture. If your board begins to show signs of wear, its finish can be restored with a food safe mineral oil or wood conditioner. First, clean and dry the board. Then, apply a thin coating with a soft cloth or paper towel. Once the conditioner has soaked into the board, buff off any excess with a clean cloth. Having excess conditioner on a wood cutting board will make it feel sticky or oily. Be sure to dry it completely before storage to prevent mold. Protect your countertops from cut marks and contamination with this American Metalcraft BB816 16" x 8" rubber wood cutting / charcuterie board with handle. 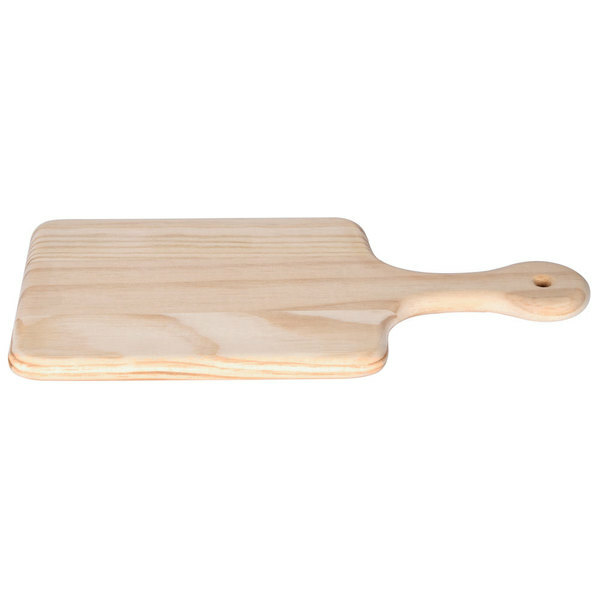 This cutting board is ideal for any busy commercial kitchen or catering business and is large enough to be used for anything from a large steak to smaller pieces of chicken. 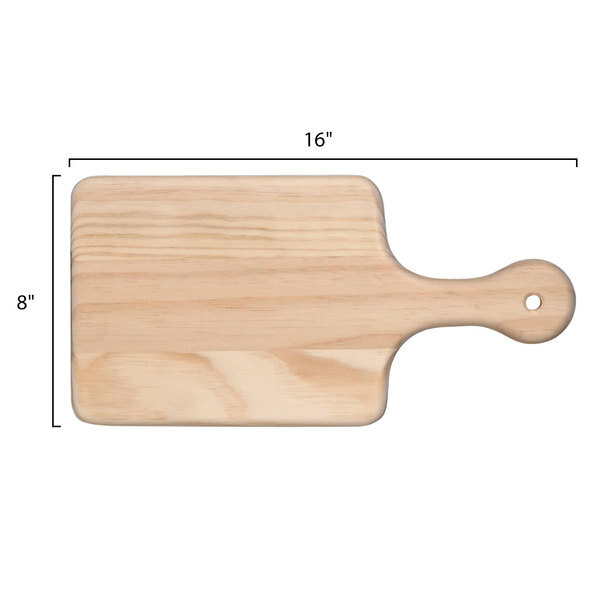 With its 3/4" thickness, this board is sturdy enough to use with many types of knives. 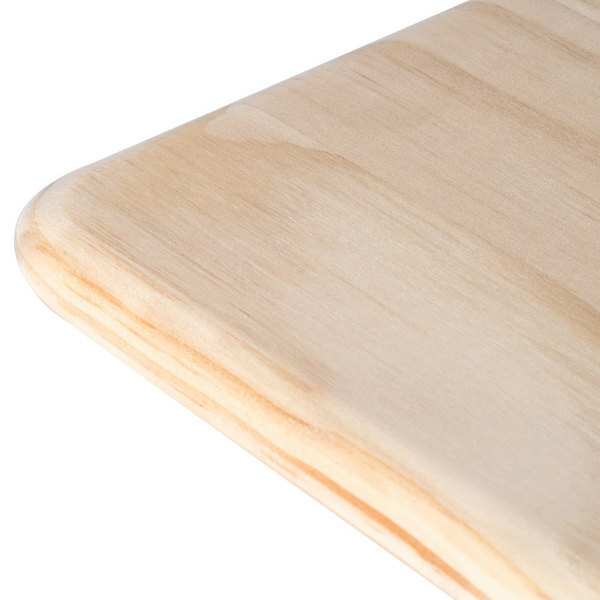 The natural beauty of this cutting board comes from the thick rubber wood from which it is fashioned. It features a handle which makes it easy to transfer your minced or julienned ingredients over to a pot or bowl, and it's also comfortable and easy to grip and hold. This attractive culinary tool could be used on a buffet or at a catered event to display bread, meats, or cheese for guests to slice. It would also be an attractive addition to any table service offering farm to table cuisine. 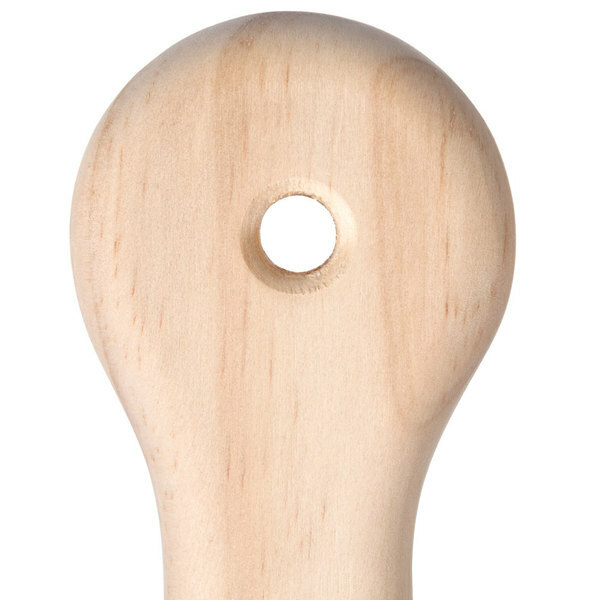 There is also a small hole in the handle, making the charcuterie board easily hung and stored away at the end of a busy day. Don't miss out on this attractive kitchen tool that will add style and convenience to your kitchen! Do not immerse wood cutting boards in water or put in the dishwasher. Overall User Rating: American Metalcraft BB816 Rubber Wood Cutting / Charcuterie Board with Handle - 16" x 8" x 3/4"
The board was incredibly sturdy and well constructed. I wish the wood its self was sanded down just a little bit more, but otherwise its a great product. The American Metalcraft Rubber Wood Cutting/ Charcuterie Board with Handle- 16" x 8" x 3/4" is a fantastic quality cutting board. It is very durable and will not break or warp easily. It is sturdy and can be hung up when not in use. This is great for cutting vegetables. The price is fantastic! This is a beautiful sturdy board and absolutely durable- we've dropped it and it didn't crack! It's beautiful wood and works well for fruits and veggies and washes well, obviously it's quite important to make sure it dries okay since the wood could be ruined if left damp. 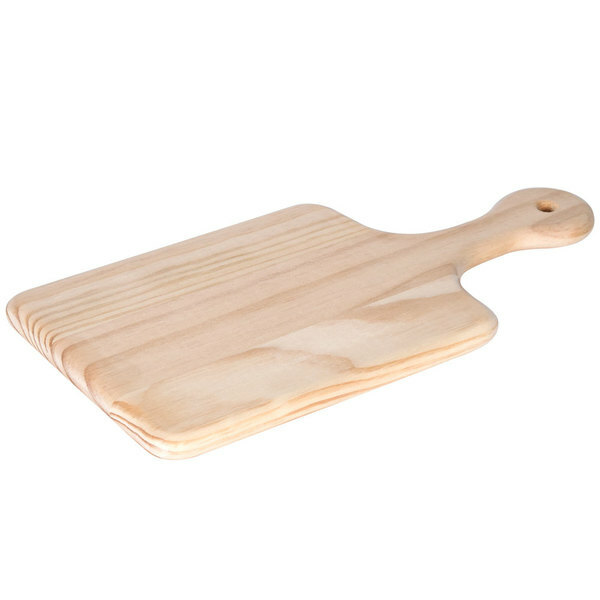 This cutting board features a light weight comstruction and is durable under pressure of knives. You'll want to purchase these in bulk as the price is perfect. I use this cutting board as a cheese platter to entertain guests. It works great, is affordable, and is beautiful! What more could you ask for? Used these on a party for individual cheese boards. The presentation was great and we oiled them before using. have since been able to use as bread boards. This wood cutting board was a good choice. 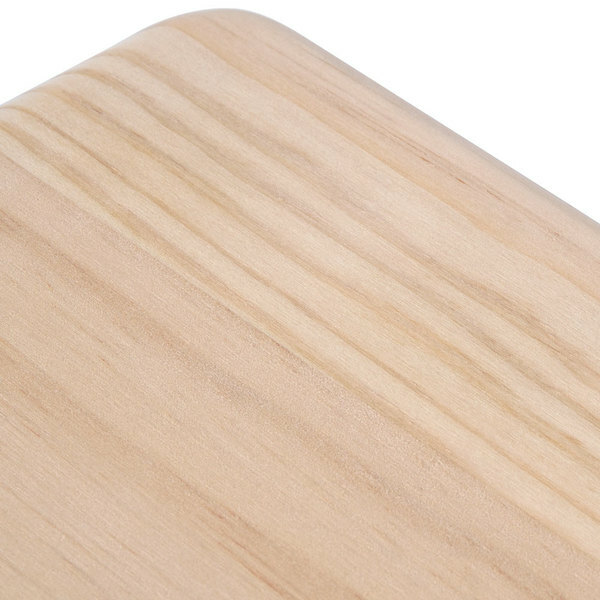 The wood is strong and the surface is very smooth. I am pleased with the quality of this board. The handle is a plus. It's easy to lift the board up. The handle is a little longer than I expected it to be, but it makes lifting easier. We ordered a few dozen of these for charcuterie and cheese board presentations. We cared for them as directed (they are only cleanable by wiping them off -- not dishwasher safe and not submersible), but they are already splitting at the seams where the pieces of wood are glued together. They started splitting after no more than a week of light use -- very disappointing! These won't hold up for a restaurant application. We will have to find something else! Thank you for your review! We are sorry to hear that the boards did not last as they should have. A Customer Solutions Representative will be in contact with you until the issue is resolved. Smaller than expected, but that is mostly my fault for not reading the description closely. A coating of mineral oil later, this is used primarily as a cheese board and gets envious looks when brought out at a gathering! 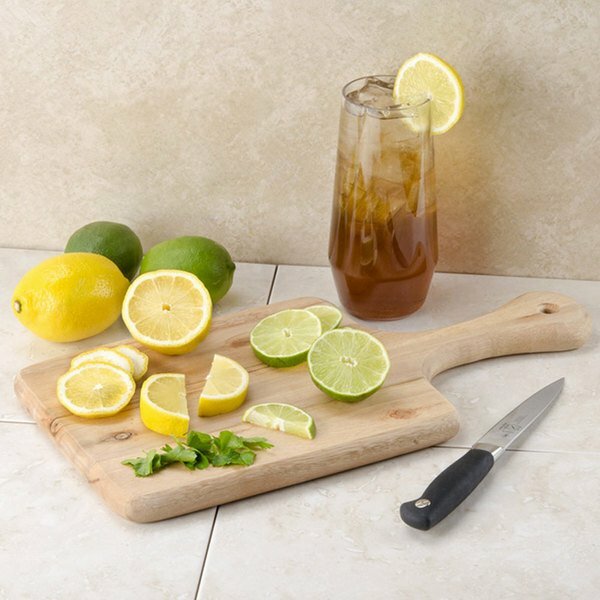 This cutting board is good for cutting fruits on,I also like it cutting vegetables they stay on the board really well.I couldn't make it in the kitchen without the cutting board. 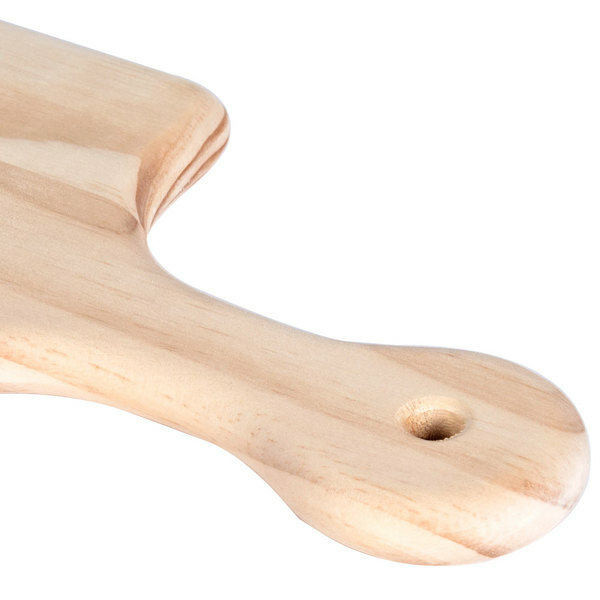 This cutting board is great for cheese or bread. You can cut up the cheese prior to bring it out to the table and the handle makes it easy to not touch the cheese. This is a great cutting board, easy to clean and store. I use it for veggies and cheese. It is sturdy and strong. It's classy looking in my kitchen.